Monica of BoomBoxBindery has made this flag book for our swap. 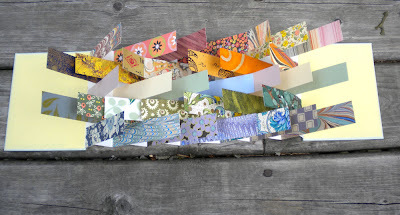 She used an assorment of decorative papers to make the flags, all cut from small pieces she had been saving, waiting to find the best use for them! The flags are arranged by colour in families of red, yellow, green, and blue. The cover paper is a print by Cavallini Papers. Monica said, "I had to chuckle when the adage about there being plenty of fish in the sea came to mind as I thought of the variety of papers included in this book." Even the closure has a story, using a hand painted thread from Kinglet Cottage Designs and a spare button from her favorite pants! 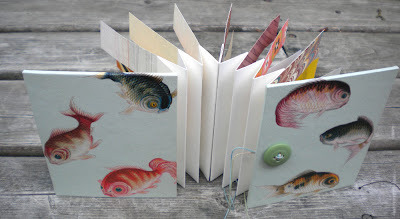 Visit BoomBoxBindery.Etsy.com to see Monica's work. Beautiful! 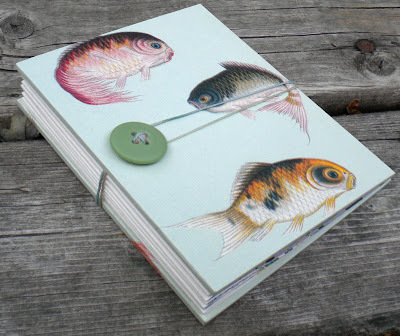 What a great idea for scraps, I love it! Love this book! How did you attach the button/string?? Monica, what a lovely book! Rhonda, I'm so glad you liked it! How cool that it has a new home in Canada! More than a book, this is art.